Hey Y'all! Happy Labor Day! I'm currently working hard, trying to get caught up on the blog and orders since we had a bit of a crazy month in August. I have to say, I schedule wayyyyy too much stuff for myself! I need to remember to pace myself! Anyway, getting back on track here. I hope you guys are enjoying the outdoors today, filled with family and friends, and having a good time! We will most likely be taking it easy today as I'm still a bit under the weather due to wearing myself out with my to-do list! I won't complain though, hopefully today will be filled with nature, maybe an ice cream cone, and plenty of Mr. and Ginny snuggles! So, today is the day I share with you my Weekly Wishes. I'm so happy Melyssa from The Nectar Collective came up with this link up! It's a great way to list your to-do list online, and hold yourself accountable! Last week, (check it out here) I completed most of the items on my list. I didn't add to it because I knew I was about to hit the wall, and I was correct! This week, I'll add a couple to the list, but the best is the announcement at the end that I know you guys will L-O-V-E! 1. Schedule blog posts a week out. I had this done for vacation, and sadly, I didn't keep it up. So now, here I am, flying by the seat of my pants again. I really admire the folks who write like this! I feel so pressured and anxious about having nothing ready to go! I need to get at least a couple of days scheduled, then I'll feel better. 3. START SCHOOL! Yes, you read that right. I haven't even started school yet. I've been so worn out and distracted with so much to do, that there is no way I can sit and study now! Thankfully, the courses start when you want them to, so I haven't been in trouble about not starting. Hopefully next week will be quieter and I can focus. 4. 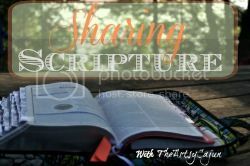 Set up "Sharing Scripture" Link up! YEAH! I shared a little about this last week here, but I really loveeee all of the hand lettering and typography I've been seeing floating around everywhere, and thought- WE NEED A LINK UP! I'm going to start it the first Thursday of every month, and see how well that works with everyone. You can link up your personal doodles, your amazing photoshop skills, or anything with scripture that you've made! It can even be items you do for sale! Amazing idea right? So, it'll be the basic rules, link only to a specific post, follow your host, moi, put the Sharing Scripture link up button on your post, and go spread some love on the person before you! Easy Peasy! Set a reminder for you, it will be up this Thursday, 9/4 and will be open for a week. I'm so excited to see every one's creative sides! what Vera stuff do you have? I might be interested in buying some of it. Hello :) popping over from The Nectar Collective :) great goals for the week! I also have a hard time with the old blog schedule and trying to get some written in advance, I always stress out if I don't have anything drafted for future posts haha. Hi, I'm visiting from the link-up. I also had troubles scheduling my blog post, but I think I came up with a solution so I hope this month I'll be able to schedule with time (it's one of my monthly goals). Oh! And your link-up idea sounds great!